Want your dog to have fun during the day? Have a high energy dog or a dog with separation anxiety? Is your dog wound up when you get home at night? Bring your dog to our doggie day care! You focus on your daily schedule while your dog plays at our facility with our trained professionals and his or her best furry friends. Our play group involves lots of play and exercise so that at the end of the day your dog will go home tired and happy. No longer will you worry about your dog when you leave home—your dog will be having fun instead of sleeping or playing with your shoes while you are gone. Before coming to Stay & play with us, all dogs must pass an evaluation. 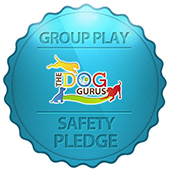 This not only ensures safety for all dogs and staff, but also lets us (and you!) know if doggie daycare is something that your pup would enjoy! Dogs have all kinds of different quirks and personalities, just like people. An evaluation is a great way to make sure that your dog's personality and behavior is a good fit for the established playgroup. Our trained staff take great care and time in acclimating a new dog to environment, slowly introducing many different types of dogs and play styles, and making sure that everyone is safe and happy in the off-leash play facility. We can't wait to get to know your pup! Your dogs will hang out in a large grassy yard, or hang out inside playing with their favorite toys. No matter what your dog’s preference is, he or she will have a blast at "Stay & Play" Doggie Daycare. All you need to do is select the best time that fits within your schedule and bring them to us. Your dog will thank you for it! Hours of Operation: M - F: 6:30a to 7p for those dogs who have daycare package. First Time at Doggie Daycare? Please download and complete our pre evaluation form and bring it with you when you arrive for your pet's evaluation. You can also email it to us. All pets that attend our Stay & Play Doggie Daycare must be spayed or neutered, be fully vaccinated with Rabies, Distemper, Bordetella (within the last 6 months), H3N2 (or combo) Influenza vaccine and a negative intestinal parasite screen. Our "Stay & Play" Doggie Daycare is next door to our animal hospital, and our loving Veterinarians are only moments away if your pet has an emergency.